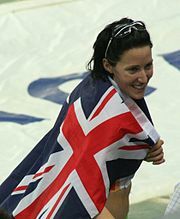 Commonwealth Games records in athletics are set by athletes competing from a range of nations within the Commonwealth of Nations. The Commonwealth Games is a quadrennial event which began in 1930 as the British Empire Games. The Commonwealth Games Federation accepts only athletes from the Commonwealth of Nations and recognises records set at editions of the Commonwealth Games. The athletics events at the Games are divided into four groups: track events (including sprints, middle- and long-distance running, hurdling and relays), field events (including javelin, discus, hammer, pole vault, long and triple jumps), road events and combined events (triathlon, heptathlon and decathlon). There are also several track and field events held for disabled athletes. Many Commonwealth Games records were set over distances using imperial measurements, such as the 100-yard dash, and (as a result of metric standardisation in 1966) many records belong to defunct events. The oldest record is George Bailey's 9:52.0 minutes in the seldom used men's two mile steeplechase, which was set at the inaugural Games. The two longest lasting records in current events were both set at the 1974 edition of the Games: Englishman Ian Thompson's record of 2:09:12 hours in the Marathon, and Tanzanian Filbert Bayi's record of 3:32.16 minutes in the 1500 metres, which was also a world record. Nathan Deakes holds two Commonwealth Games records: the 20 km and 50 km walk events. Adekunle Adesoji and Chantal Petitclerc also hold two records each in the para-sports events. 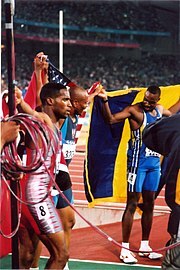 Ato Boldon (left) beat 200 m record holder Frankie Fredericks in 1998 to set the current 100 m record. 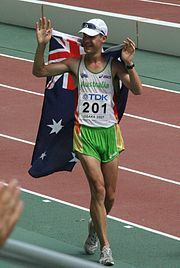 Former 50 km walk world record holder Nathan Deakes holds the record for the 50 km walk event. 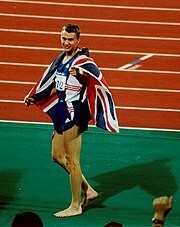 Current triple jump world record holder Jonathan Edwards set the triple jump Commonwealth record in his home nation in 2002. ^ Bayi's world record stood for over five years, eventually being beaten by Sebastian Coe in 1979 (see World record progression 1500 metres). Furthermore, the time still stands as the Tanzanian national record. ^ Thompson's run was the British record from 1974 until 1983 when it was beaten by Geoff Smith. 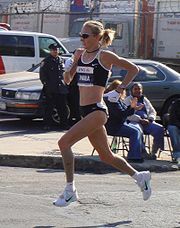 Current Marathon world record holder Paula Radcliffe broke the 5000 m record on home soil in 2002. Jana Pittman retained her 400 m hurdles title with a record breaking run. Commonwealth Games Athletics Records. Commonwealth of Nations. Retrieved on 2009-07-27. Commonwealth Games Stats. Track & Field News. Retrieved on 2010-10-08. ^ "400m Results". www.glasgow2014.com. 30 July 2014. Retrieved 31 July 2014. ^ 1500 Metres All Time. IAAF. Retrieved 2009-05-05. ^ "10000m Results" (PDF). gc2018.com. 13 April 2018. Retrieved 16 April 2018. ^ United Kingdom All Time Lists - Men. GBR Athletics. Retrieved on 2009-05-05. ^ Biography van Zyl, L.J. IAAF. Retrieved on 2009-05-05. ^ "3000m Steeplechase Results" (PDF). gc2018.com. 13 April 2018. Retrieved 13 April 2018. ^ High Jump All Time. IAAF. Retrieved on 2009-05-05. ^ "Men's Long Jump Results" (PDF). gc2018.com. 11 April 2018. Retrieved 13 April 2018. ^ "Shot Put Qualification Results" (PDF). gc2018.com. 8 April 2018. Retrieved 8 April 2018. ^ "Discus Throw Results" (PDF). gc2018.com. 13 April 2018. Retrieved 16 April 2018. ^ "Hammer Throw Results" (PDF). gc2018.com. 8 April 2018. Retrieved 14 April 2018. ^ "20km Race Walk Results" (PDF). gc2018.com. 8 April 2018. Retrieved 14 April 2018. ^ Athlete Profiles Nathan Deakes. Athletics Australia. Retrieved on 2009-07-27. ^ "4×100m Results". www.glasgow2014.com. 2 August 2014. Retrieved 3 August 2014. ^ 'I thought I'd won'. Sports Illustrated (1998-09-21). Retrieved on 2009-05-05. ^ "100m Results". www.glasgow2014.com. 28 July 2014. Retrieved 28 July 2014. ^ "200m Results" (PDF). gc2018.com. 12 April 2018. Retrieved 15 April 2018. ^ Mike Rowbottom (9 October 2010). "Langat breaks Games 1500m record, Turner leads high hurdles sweep for England in Delhi – Commonwealth Games Day Three". IAAF. Retrieved 9 October 2010. ^ "800m Results" (PDF). gc2018.com. 13 April 2018. Retrieved 16 April 2018. ^ "1500m Final Results" (PDF). gc2018.com. 10 April 2018. Retrieved 14 April 2018. ^ Biography Kosgei Salina Jebet. IAAF. Retrieved on 2009-05-05. ^ Commonwealth Games Statistics – Women’s Marathon (contested from 1986). Track & Field News. Retrieved on 2010-10-08. ^ "100 Metres Hurdles Heats Results". www.melbourne2006.com.au. 23 March 2006. Retrieved 12 October 2010. ^ "Pole Vault Results" (PDF). gc2018.com. 13 April 2018. Retrieved 16 April 2018. ^ Mike Rowbottom (10 October 2010). "Two more gold for Kenya, Adams dominates Shot Put - Commonwealth Games Day Four". IAAF. Retrieved 11 October 2010. ^ Pentony, Luke; Maasdorp, James (12 April 2018). "Commonwealth Games: Kurtis Marschall wins gold in pole vault, Dani Stevens crushes field in discus". ABC News. Retrieved 15 April 2018. ^ "Hammer Throw Results". www.glasgow2014.com. 28 July 2014. Retrieved 28 July 2014. ^ "Commonwealth Games: Brandon Starc, Kathryn Mitchell, Isis Holt among the Australian golds on night seven". ABC News. 11 April 2018. Retrieved 15 April 2018. ^ Matthew Brown (20 March 2006). "79,000 witness Powell saunter to 100m gold - Commonwealth Games, Day Two". IAAF. Retrieved 13 November 2010. ^ "Women's 4×100m Round 1 - Heat 2 Results". www.glasgow2014.com. 1 August 2014. Retrieved 2 August 2014. ^ "Men's 100m T11/12 Round 1 Heat 2 Results" (PDF). gc2018.com. 12 April 2018. Retrieved 16 April 2018. ^ "Men's T37/38 100m Final Results" (PDF). gc2018.com. 9 April 2018. Retrieved 14 April 2018. ^ "Men's T54 1500m Round 1 Heat 2 Results" (PDF). gc2018.com. 9 April 2018. Retrieved 14 April 2018. ^ "Men's Marathon T53/T54 Results" (PDF). gc2018.com. 15 April 2018. Retrieved 16 April 2018. ^ "Women's 100m T37/38 Results" (PDF). gc2018.com. 13 April 2018. Retrieved 16 April 2018. ^ "Women's 1500m T53/54 Results" (PDF). gc2018.com. 10 April 2018. Retrieved 15 April 2018. ^ "Women's T38 Long Jump Results" (PDF). gc2018.com. 8 April 2018. Retrieved 14 April 2018. ^ "Women's F46 Javelin Throw Results" (PDF). gc2018.com. 9 April 2018. Retrieved 14 April 2018.